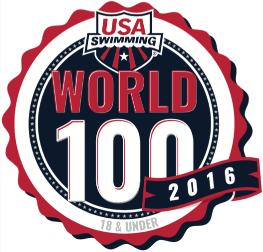 USA Swimming allows teams who have 18 & under swimmers in the top 100 to display a "World 100" badge on their website. Please only use this feature if your team qualifies. In the side menu, click Team Admin > Website Design. Click Website Layout Configuration button. Scroll down to Template Controls. Set 18 & Under World 100's to Yes. You will then see the badge displayed at the top of your site alongside your USA Swimming and LSC badges.